In the last episode, Congress voted to authorize a Continental Army and chose George Washington to lead it. Before word of Congress’ decision reached Boston, the Provincial Army would clash with the regulars at the Battle of Bunker Hill. 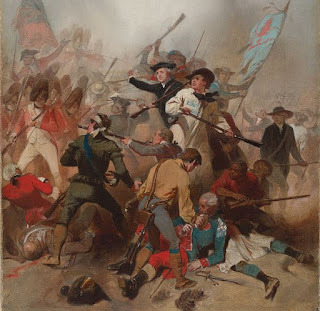 The Massachusetts Provincial Army had been besieging the regulars in Boston since the evening of April 19, 1775, when they chased the regulars back from Lexington and Concord. In Boston, Gen. Gage had assumed a defensive posture. With the arrival of Generals Howe, Burgoyne, and Clinton and their reinforcements, the British decided it was time to go on offense again. On the southern side of Boston Harbor sat Dorchester Heights. This high ground would give the Provincials the ability to bombard both Boston and the fleet in the harbor. Similarly, on the northern side of the harbor on the Charlestown Peninsula, Bunker Hill and Breed’s Hill provided attractive high ground which could threaten both Boston and the fleet. For months, the British had kept the provincials from occupying either high ground by threatening to attack if they dared attempt such an occupation. So far, those threats had worked, but there was no guarantee that would continue. The three new generals who had arrived recently were eager to prove that their leadership could put the militia on the run and that Gage was simply too timid to get the job done. In early June, Gage held a council of war at which his officers agreed on a plan to capture both of these key locations. Gen. Howe, the senior officer below Gage, would lead the attack. On Sunday June 18th, British artillery on Boston Neck would open up on the provincials in Roxbury. Gen. Howe then would lead an infantry attack across the neck taking Roxbury and then Dorchester Heights behind it. From there, several regiments would move north to Cambridge, chasing off the Provincial Army command, then moving onto the Charlestown Peninsula where they could occupy Bunker Hill. The new officers assumed that the provincials would simply break and run in the face of the British regulars’ well-organized assault. I can almost hear Gen. Gage thinking to himself: Yeah, good luck with that guys. These provincials fight a lot harder than you think. Still, Gage approved the plan. In truth, the provincials had not actually held any ground against the British at Lexington or Concord. They simply used a series of hit and run attacks to make life miserable during the march. It was not unreasonable to assume that even if there was a firefight, the British force would not have a problem capturing the unoccupied high grounds at both Dorchester Heights and Bunker Hill. The Council gave field command to Massachusetts Colonel William Prescott for the occupation of the hill. Prescott had seen action in both King George’s War and the French and Indian War. His leadership in the assault of Nova Scotia in 1755 resulted in an offer of a commission with the British regulars, an offer he declined. After the French and Indian War, Prescott lived as a country farmer and an officer in his local militia. His militia unit had marched to Concord after hearing the alarm on April 19th, but living way up on the New Hampshire border, about 40 miles from the battle, arrived too late to see any action that day. Prescott and his militia had participated in the ongoing siege ever since. 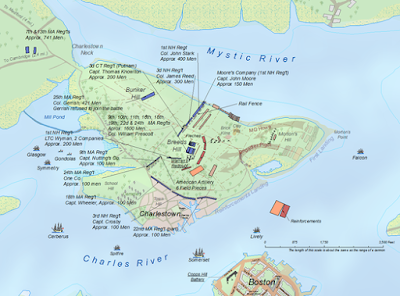 On the evening of June 16, Prescott led about 1000 Massachusetts militiamen onto the Charlestown Peninsula. He had orders to set up a defensive line on Bunker Hill. Joining the Massachusetts militia were about 200 Connecticut militia. 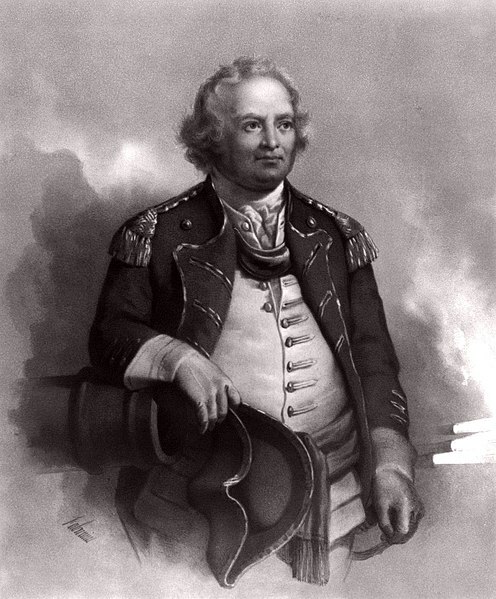 Connecticut General Israel Putnam joined the Connecticut militia assigned to the mission. Although he outranked Colonel Prescott, Putnum did not assume command. Prescott remained in charge of the mission. Lt. Col. Richard Gridley, an engineer and head of artillery provided guidance on how best to fortify the hill against an attack. For some reason, once the men arrived on the site, they fortified Breed’s Hill instead of Bunker Hill. Breed’s Hill was not as elevated. It also stood closer to Charlestown Village and the harbor. The Provincial’s presence there would present a threat to the British army and navy since heavy artillery could hit Boston from there, as well as ships in Boston Harbor. Breed’s Hill also made an easier target for British artillery. The new location made any retreat more difficult as defenders would have to retreat up Bunker Hill before they could cross the Charlestown Neck back to the main army. There is no good record why they made this last minute location adjustment. It may have been Gen. Putnam who encouraged the more aggressive position. That certainly seems in keeping with his character. In any event, the men began digging entrenchments and fortifications on Breed’s Hill around midnight. If they hoped to go undetected until morning, they would be disappointed. In Boston, Gen. Clinton went for a late night walk, and heard the digging and construction taking place across the harbor. He alerted Generals Gage and Howe. The Generals, though, decided to wait for daylight when they could see for certain what was happening. Even if the provincials were up to something, no one wanted to consider a spontaneous nighttime attack without any preparation or planning. 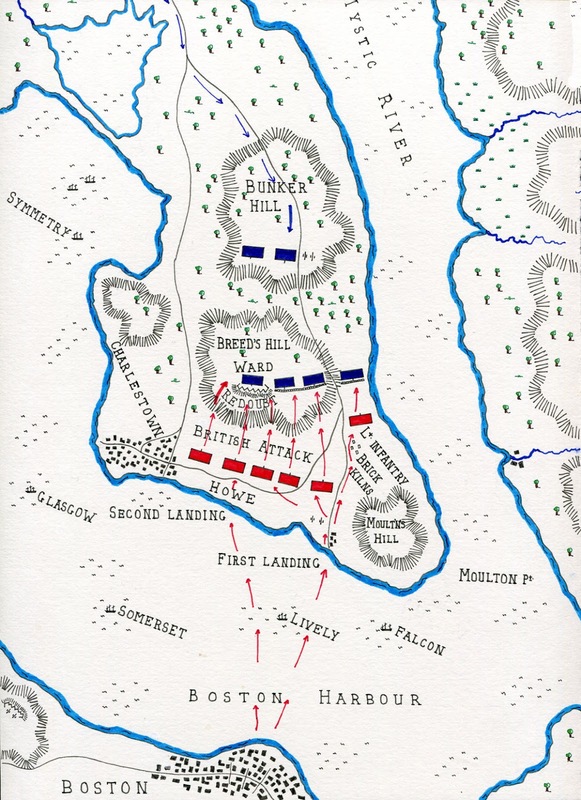 At dawn on June 17, the British saw the provincials hard at work fortifying Breed’s Hill. Admiral Graves positioned eight naval vessels and soon opened up an artillery barrage. But solid shot at that distance was pretty ineffective in taking out soldiers. Almost all of the balls simply sunk into the mud of Breed’s Hill. The men soon realized how ineffective it was, and got back to work. One lucky shot did manage to decapitate one unlucky militiaman, but that was it. The officers quickly and unceremoniously buried the solder on the hill, mostly so his comrades would not become unnerved by having to look at his decapitated body all day. Of course, if they had been fortifying Bunker Hill instead of Breed’s Hill as ordered, they would have been much more difficult targets for the naval artillery. With the defenses mostly in place by late morning Col. Gridley left the field, before any combat started. Many of the militiamen also left the hill before things got too dangerous. All day, Col. Prescott would have to deal with a slow trickle of desertions. Around 9 AM, Prescott called for reinforcements, expecting an all out attack. His men, who had been digging all night, were exhausted. Most also did not have provisions and were getting pretty hungry and thirsty as well. In Cambridge, Gen. Ward received a request for reinforcements at around 10 AM, but decided not to send any. Gen. Putnam, who had been on the hill all night, personally went to plead with Ward for more troops. 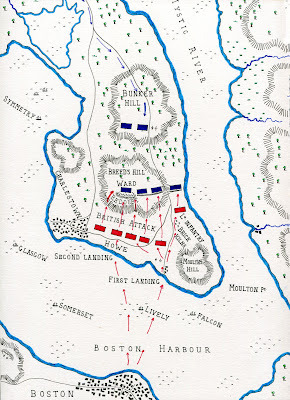 Ward was still worried that the British would begin their main assault against Roxbury on the provincial’s right flank. Gen. Percy had begun an artillery barrage across Boston Neck. This could have been a prelude to an assault on the still unoccupied Dorchester Heights. It was, however, simply a feint to keep the provincials occupied so they would not send more reinforcements to Bunker Hill on their left flank. It worked. Ward kept his reinforcements around Cambridge, in the center of the provincial line. 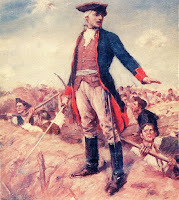 From there he could deploy his forces south toward Roxbury or north toward Bunker Hill depending on what the enemy did. Putnam persuaded him to send another 200 New Hampshire militiamen, not even enough to replace the overnight desertions. The bulk of the more than 10,000 man provincial army simply sat around waiting in reserve. Col. Prescott’s men continued to work on their defenses all morning. Around mid-day, several provincials arrived with cannons to place in the redoubt on Breed’s Hill. Unfortunately the defenders had made no provisions for cannons. Prescott had already sent his digging tools back to Bunker Hill. He did not want to send more men to bring them back. Those who took them away used the opportunity to flee the field and not return. If he sent more to collect them, those soldiers would likely flee as well. The men tried to dig holes in the mud by hand, but made little progress. Finally, they simply loaded a cannon and fired a ball through the mud embankment, thus creating a gun hole. So far, the provincials had to face only a few cannon balls lobbed their way. At daylight, back in Boston, British Gen. Gage convened another council of war to decide how to respond to the Provincials. After some debate, the council agreed that Gen. Howe would lead about 1500 regulars across the harbor, to a point just south of Breed’s Hill and near Charlestown Village. From there, the main force would assemble and directly assault the unfinished entrenchments. A secondary force would make a flanking maneuver on the right against the undefended portion of Breed’s Hill. Assembling the men would take time, and it would be difficult to land them at low tide. With high tide at around 3PM, they planned to land the men during the early afternoon, for a late day assault. Throughout the early part of the day, the navy continued its fire on the provincials. The army would also fire from Copp’s Hill in Boston, too far to do much damage. British cannons kept up a constant, if relatively ineffective barrage against Breed’s Hill. Admiral Graves also maneuvered several gondolas mounted with cannons into the shallow waters just south of Charlestown Neck. This gave the navy a position to fire on any advancing reinforcements or retreating enemy who tried to cross the neck. By mid-afternoon, Gen. Howe had landed most of his force of 1600 east of Charlestown village, at Moulton Hill, just southeast of Breed’s Hill. His troops landed safely out of range of musket fire. By this time, he saw that his planned assault on the Provincial left would have to get through the defensive barrier that Prescott had spent the day building. Howe felt confident his men could take the defenses. To make certain though, he decided to bring over another 700 reinforcements so that he could hit the Provincials with overwhelming force. The regulars settled down to have an early dinner while they awaited the reinforcements. Meanwhile Prescott’s provincials continued to dwindle. Militiamen, hungry, tired, or just plain scared slipped away before battle even began. The extra time did give Prescott even more time to improve his defenses. But he needed reinforcements if he wanted to have any hope of standing up to the ever-growing army of regulars making their way across the harbor to Charlestown. Howe’s landing showed Prescott that he was vulnerable on the provincial army’s left flank. Howe could simply march his men across the field to the east of Breed’s Hill, come around from behind, and capture the entrenchments. Prescot deployed Captain Thomas Knowlton of the Connecticut militia to set up a defense on the left flank. Knowlton began building up a breastwork around a rail fence. Even so, Knowlton did not extend his defenses all the way to the edge of the Mystic River. He left a pass open along the shore where Howe could send his grenediers and move up behind Prescott’s lines. Eventually though, Col. John Stark, who commanded the New Hampshire reinforcements that Ward had approved, saw this weakness and built a breastworks along the beach and used his infantry to protect against any British flanking maneuver. This would later prove critical to protecting the provincial lines. Prescott also ordered Lt. Col. John Robinson and Maj. Henry Woods to take several companies forward on the American right. They advanced toward Charlestown, with orders to harass the British troop landings from there. On Bunker Hill, Putnam found his artillery commanders, Captain Callender and Captain Gridley nephew of Lt. Col. Gridley, the engineer who had set up the entrenchments on Breed’s Hill the night before and then left the field. The officers had almost no experience firing their weapons. Upon finding their powder charges too large to fit down the barrels, they simply gave up on firing. Putnam argued with them, showing them how they could ladle the powder into the cannon, then fire. Yes, it took a little longer, but better than doing nothing. 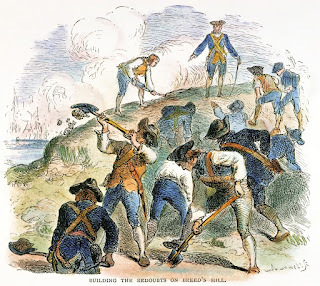 He ordered them onto the field in front of Bunker Hill, where they could fire at the British landing. The artillery crews fired a few rounds but were horribly inaccurate. They eventually gave up again and tried to pull back. Putnam, angry at the unauthorized retreat, demanded they go back and fight. They succeeded in drawing away British artillery fire from Breed’s Hill and towards themselves. One British round hit and destroyed one of the Provincial cannon, killing several of its crew. That was enough for most of the artillerymen, who either slipped away to join the infantry, or deserted altogether. Captain Callender tried to retreat with his guns, but ran into Gen. Putnam again. Callender first claimed he was out of ammunition. But when Putnam opened his ammunition boxes and found them full, he angrily demanded Callender return to the field. Then Callendar told him that as a Massachusetts militia officer, he had no obligation to obey the orders of a Connecticut officer. At that point, Putnam threatened to kill Callender unless he returned. The shamed Callender agreed to return, but as soon as Putnam rode off, Callender and his men abandoned their guns and fled from the field. Both Captain Callender and Captain Gridley would later face courts martial and leave the army. Gridley was found not guilty, but apparently soon afterward resigned his commission The court martial found Callender guilty and dismissed him from the army. As a side note, after losing his commission, Callender continued to serve as a volunteer and hoped to redeem himself. He fought bravely the following year in New York, refusing to retreat. He was nearly killed by the enemy on Long Island. A British officer, noting his brave defense, prevented his troops from killing him. Callender spent more than a year as a prisoner of war in hellish conditions before being exchanged. After that ordeal, he had his commission and honorable reputation restored. By early afternoon, Gen. Ward realized a British assault on Roxbury looked less likely and decided to commit more provincials to Bunker Hill. However, as companies attempted to pass over Charlestown Neck, they felt the impact of the British navy’s gunboats that Graves had deployed to attack anyone attempting to cross the neck. Two larger ships also had cannons within firing range of the neck. Units attempting to cross would take casualties. The inaccurate cannons would not kill many, but a few beheadings by chain shot was enough to intimidate most unseasoned militia from risking the crossing. As a result, many companies simply waited on the mainland side hoping they would not receive orders to march through the field of fire from the enemy cannon. Among those was a company commanded by Major Gridley, the son of Col. Gridley and cousin of Captain Gridley. Showing the same level of coolness under fire as the rest of his family, Major Gridley refused to cross Charlestown Neck and later faced a court martial for breach of duty and refusal to obey orders. New Hampshire Colonel Stark, returning with more New Hampshire troops had to push his way around other companies too scared to make the crossing. Around the same time Joseph Warren also walked over the neck. Warren, who had been suffering from a migraine all morning, was determined to join the fight. The Provincial Congress President had recently been appointed a major general in the Provincial Army, and while retaining his appointment as President. His colleagues begged him not to go, but Warren insisted he would not demand others take risks that he would not. He met up with Prescott on Breeds Hill, insisting he would serve only as a volunteer soldier and would not take command. Other companies would also cross, but almost none joined the actual battle. Instead, most of those who crossed onto the Charlestown Peninsula watched events unfolding on Breed’s Hill from the relative safety of Bunker Hill. Even Bunker Hill was too scary for some. Col. Samuel Gerrish took one look at the enemy from Bunker Hill and ordered his men to retreat. When Putnam attempted to force his men forward. Gerrish literally threw himself on the ground and claimed he was too exhausted. He would soon retreat with most of his men. Amazingly, Gerrish was not court martialed for his cowardice on this day, but would be court martialed a few months later for similar actions. Aside from Stark’s reinforcements of the left flank, Prescott would receive almost no reinforcements on Breed’s Hill itself, other than the arrival of General Warren. In fact, his force on the hill had dwindled to about half its original size due to desertions. About 500 defenders on Breed’s hill had been there all night building the defenses, with little food, drink or rest. They now faced a force of over 2500 British officers and men, as well as 125 field artillery, not counting the artillery still firing from Copp’s Hill in Boston and from the fleet in the harbor. Lincoln, William (ed) The journals of each Provincial congress of Massachusetts in 1774 and 1775, and of the Committee of safety, Boston: Dutton and Wentworth, 1838. Swett, Samuel History of Bunker Hill Battle: With a Plan, Boston: Munroe and Francis, 1826. VIDEO: Uhlar, Janet Dr. Joseph Warren: Early American War Hero (1 hr) Bedford TV, 2016. Fleming, Thomas Now We are Enemies: The Story of Bunker Hill, St. Martin’s Press, 1960. Forman, Samuel Dr. Joseph Warren: The Boston Tea Party, Bunker Hill, and the Birth of American Liberty, Pelican Publishing, 2011. Lockhart, Paul The Whites of Their Eyes, New York: Harper Collins, 2011. Nelson, James L. With Fire and Sword: The Battle of Bunker Hill and the Beginning of the American Revolution, New York: St. Martin's Press, 2011. Philbrick, Nathaniel Bunker Hill: A City, A Siege, A Revolution, New York: Penguin Books, 2013 (Book recommendation of the week). This entire podcast is fantastic. It's detailed, comprehensive and most importantly entertaining. I'm a big David McCullough fan and I think this ranks up there with him. Few people can make history so interesting. I've enjoyed it so much that I am going through it again while I'm waiting for more episodes. I don't have the patience to wait weekly. Please do other history topics when you are finished.